The new Samplitude Music Studio 2019. More for artists. More for music. The new Samplitude Music Studio 2019 offers ambitious musicians and bands even more freedom to express their creativity - with top-quality instruments, professional effects and functions for jamming, composing and recording. The program sets itself apart with a fully intuitive interface, which now features a modern and elegant carbon style. The brand new version of Samplitude Music Studio: Music creation and production on a professional level! Samplitude Music Studio now includes more Vita instruments than ever before for an even greater range of options for creative composition. Orchestral Ensemble, Grand Piano and Sansula all bring excellent sound for building an authentic music experience. Brass and woodwind, drums, strings and a whole range of additional sounds: compose breathtaking orchestral music with Vita Orchestral Ensemble. This virtual plug-in instrument is perfect for film and pop music producers. There's nothing better than an authentic piano sound, whether it's used in classical music, pop, jazz or hip-hop. And that's exactly what Vita Grand Piano offers. This virtual instrument enables you to bring compositions to a new, unheard-of level of quality. Vita Sansula brings a unique kalimba sound with a floating, almost-spherical character. With this virtual instrument, you can compose vibrant melodic sequences that will connect with the listener. The new Samplitude Music Studio contains even more effects for mixing and mastering. With plug-ins included in essentialFX Suite, achieve a more professional sound than ever before for your mix. 11 high-quality plug-ins within a single suite - essentialFX Suite. The effects offered by this professional studio tool are calculated using high-quality algorithms and offer excellent sound. essentialFX Suite is also impressive due to its clearly laid-out control elements and low resource consumption, which provides the ideal workflow and unparalleled sound results. A flexible plug-in for noise reduction with soft knee options and sidechain filter function for rhythmic ducking effects. eFX Vocal Strip is a channel strip with compressor, DeEsser, gate, high-pass filter and shaping sound – optimized for vocal and speech recordings. A plug-in for classic and modulating tremolo effects that offers options for editing rates, shapes, tremolos, tempo synchronization and panoramas. The dynamic eFX DeEsser filters out unwanted "s" sounds from speech and vocal recordings. A classic phaser effect for adding more resonance to main tracks and more dynamics to guitar. Settings for speed, depths, feedback and mixes can all be defined using eFX Phaser. eFX Limiter is an ultra-efficient dynamic plug-in for enhanced volume of an audio signal and for avoiding clipping. This plug-in lets users apply diverse reverb effects with short to long reverberation times and also bring more punch and atmosphere to your sound. eFX Stereo Delay can be used with any track and offers customizable delays for both channels, as well as a smart tempo sync feature. eFX Compressor offers level compensation for audio files and enables you to add punch. In addition to standard control elements, this classic compressor contains a soft clip function and an advanced side chain filter. This plug-in offers everything for adding more depth to your audio - from subtle chorus effects right up to dramatic flanger sounds. The eFX Chorus Flanger can also be used to easily define settings for frequency depth, feedback and the mix. This effect plug-in simulates the warm sound of analog tube amps with total authenticity. eFX Tube Stage contains excellent pre EQs and post EQs and oversampling mode for a perfect, analog sound. New features in Samplitude Music Studio simplify your music production workflow even further. Discover automation for mastering and MIDI Velocity Dynamics and use up to 32 instruments simultaneously within a single project. Add more feeling to a composition and achieve unparalleled sound for your songs, while maintaining full control of your music productions at all times. Mastering made easy: The master automation function can be used to define the behavior of various parameters in the master channel - e.g. volume or panorama - and additional parameters while the track is playing. Never lose the feeling and the control over your sound. MIDI Velocity Dynamics lets you edit and modify velocity dynamics for your instruments – both during and after recording. Load to 32 instruments simultaneously - even within a single project That's twice as many as before. This enables even more creative freedom when composing and arranging your songs. The most obvious feature in Samplitude Music Studio is something you'll notice right away when you open the program: the redesigned interface, which features a modern, refined carbon style. 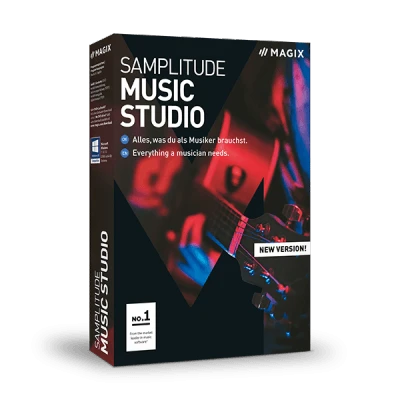 Samplitude Music Studio is now impressive not just in terms of its easy and intuitive operation, but its appearance too. Introducing the brand new content platform for producers - Producer Planet. Browse a massive selection of loops and samples, virtual instruments and more for audio and video products. The ideal platform for professional producers on the hunt for the precise tools and resources they need for their projects. Record. Restore. Edit. Enhance. Deliver. The perfect addition to your home studio. SOUND FORGE Audio Studio delivers the goods whether you are recording your band or podcast, digitizing your vinyl collection, creating sound effects for your new video, creating loops for your new tracks, or mastering your latest CD. Built on a 64-bit architecture to bring you more editing power, more processing power and a more powerful workflow.